Beyonce will be embarking on her first solo tour since 2013’s Mrs. Carter Show World Tour later this year when she kicks off her The Formation World Tour on April 27th in Miami, Florida. 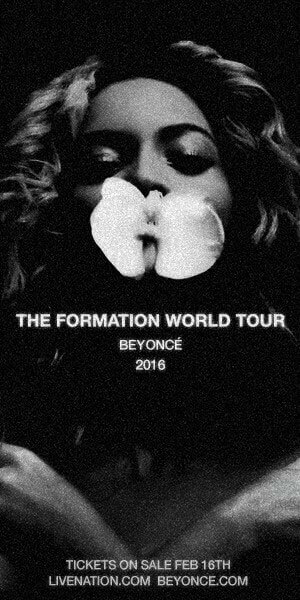 Beyonce’s upcoming tour will stop in stadiums in cities in North America including Nashville, San Diego, and Boston. She’ll also tour in Europe beginning June 28th in Sunderland, UK. Ticket sales will begin on Monday, February 15th in Europe and Tuesday, February 16th in North America. Beyhive members can purchase tickets beginning Tuesday, February 9th and Monday, February 15th for shows going on sale on February 22nd. For more info, visit www.beyonce.com.